These Teeny Tiny Teddies in baskets look great on the Christmas tree! I have already introduced you to my Teeny Tiny Baskets with Teddies Inside, and I am pleased to say that they are very popular at Christmas Fairs. Baskets with teeny teddy inside are priced at £1.50 each, so make lovely stocking fillers or pocket money presents. I’m afraid that I won’t be posting these online at this time, because postage and packing costs would have to be added. However, if anyone reading this cannot make it to our markets, but wants to contact me about purchasing one or more, I’ll see what I can do. Posted on November 22, 2018 November 20, 2018 by Silvi VealePosted in Christmas Fairs, Little Bags, Teddies in Baskets, Teddy in a bagTagged Children's bags, Christmas Fayres, Crochet Bags, small bags, stocking fillers, Teddy Bags, tiny bags, tiny baskets, tiny teddy, Turquoise. I have already posted about one child’s cotton shopper bag with the floral print cotton shopper. But I think you will like this addition just as much if not more: It’s a lovely double-sided shopper made with pretty elephant print cotton, coupled with stars. And all in a nice, bright red – just right for Christmas (and the rest of the year too 🙂 ). And of course I mustn’t forget to add that there will be a tiny teddy in the front pocket of each shopper. Small, jointed teddy is 3 inches (7.5 cms) tall. This little shopper/tote will make a lovely gift for a child who wants to help with the shopping or to take their special items to school or just to carry toys and play. However, although the teddy has a CE mark, I would not recommend leaving the teddy in the bag when giving to children under 3 years old to play with unsupervised, owing to small parts. These children’s shoppers sell at £8.00 each at Markets (this includes the tiny teddy of course) and will retail for £11.50 online and in the Elephant Sun Dog Etsy shop (online price includes postage, packing and processing fees). I’m sure you will agree that they are an ideal present for children, both boys and girls. Posted on November 10, 2018 November 7, 2018 by Silvi VealePosted in Childs Cotton Shoppers, Christmas Fairs, Cotton Bags, Teddy in a bag, Tote BagsTagged child's shopper, Children's bags, childs tote, Christmas Fayres, cotton, elephants, medium bags, Teddy Bags, tiny teddy. They are made with 2 coordinating cotton fabrics and they are double-sided (so that you can actually reverse them and have the pocket on the inside if you prefer). 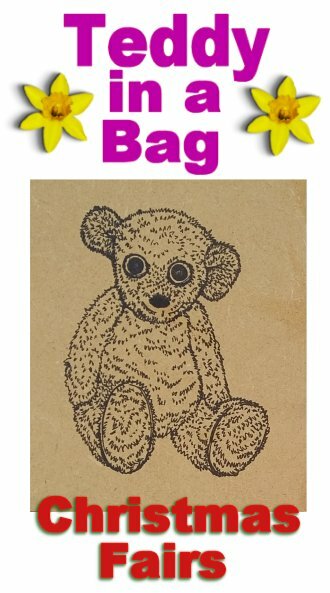 This little bag has a tiny teddy in the pocket which matches the teddies on the print. And, when the teddy is outside, the large pocket is roomy enough to carry small treasures too. The bag is approximately 9 inches in length (not counting the shoulder strap) by 7.5 inches wide, and the tiny teddy is 3 inches high. I would recommend though, that for the under threes, even though the tiny teddy is guaranteed with a CE mark, that it is taken out, or supervised, owing to small parts. These little bags are priced at £6.50 at Christmas markets or at £9.00 (includes postage, packing and processing costs) in our Etsy shop. I will post some more of these pretty tote bag designs soon. Pretty little bags all with a tiny teddy in the front pocket. I’ve already posted an update on the Little Lilac Bags I have been busy making to replenish Teddy in a Bag stock, but also extremely popular in our small bags range are the little bags made with dark pink sparkle yarn and a cream trim. So, I am busy making more of these little bags, ready for Christmas fairs and markets. Each bag, complete with tiny (3.5 inch) teddy, costs £5.00 to purchase at one of our markets or fairs. It will cost a little more if we sell them online, owing to postage and processing costs. But either way, these are well-loved little bags, which will make any child happy when they receive them. Posted on October 29, 2018 October 23, 2018 by Silvi VealePosted in Little Bags, Shoulder Bags, Teddy in a bag, Tote BagsTagged Children's bags, Crochet Bags, Shoulder Bags, small bags, Teddy Bags, tiny teddy.